Frame is beautiful. Detail achieved with plaster which makes frame very heavy. Writing as an old structural engineer so know what I write - wire was tied straight across and attachments pointed straight up. (theoretically if truly straight across the force in the wire is infinite) This arrangement with a heavy frame results in very high lateral force on the attachment. In this case it caused the ring at the attachment to open. Luckily it did not come unattached until I set the frame down which released the tension. Fix by supplying enough slack in the wire to come into the attachment on the frame at a decent angle and angle the attachment in the direction of the approaching wire. I will hang with two clips about 12 inches apart and maybe about 3-4 inches above where the clips attach to the frame. Most framers that I have seen make this mistake and for a frame that weighs a pound or two it makes little difference. You all came very close to having to replace a $300+ frame. Hello Niel! Thank you so much for your valuable comments. We have certainly dully noted your suggestion, and we are grateful for your feedback as a structural engineer. We apologize for any inconvenience. If you need any further assistance, please do not hesitate to reach out to us. Have a great day and Happy Framing! Takes pic to a whole new level! The frame is amazing, and it was so easy to put together. It totally changed the picture. I wish I hadn’t waited 2 years to get it done. Highly recommend. It came quick and was well packaged. Will this fit a canvas that is 3/4 thick? Thanks! Thank you for your inquiry. We encourage you to order a free 3" sample. With a sample in hand, you will be able to see how your canvas sits in this ornate canvas floater. If you have any additional questions do not hesitate to contact your friendly framing experts at 1-800-332-8884. I've used this with one inch thick panels, 3/4 inch should be fine. You can always order a free sample if you are unsure of how it will work/look. Yes, since it is a floater it allows that thickness, I have 1 inch canvas in mine and looks great. Do not see why not - check cross section dimensions of frame for exact reveal. how much would RRF11 (38 x 25-canvas size) weigh? BEST ANSWER: I'm not sure of the exact weight but I would guess >7 lbs. It will be quite heavy. Does this frame have mat options? BEST ANSWER: Hello Laura! This exquisite frame is designed as a Floater Frame and does not have a lip on the face of the frame to hold a Mat. Thank you for your inquiry! There is no option for a free sample on this product. RRF11 Espresso frame.Please advise? BEST ANSWER: Hello Celeste. We have the RRF11 available in a sample size. We apologize you were not able to order the sample on the website. As a courtesy, we are sending you a 3" sample of the frame at no charge. The sample will arrive within 7 business days. Please let us know if you need further assistance. Happy Framing! What is a canvas floater frame? BEST ANSWER: Hello! A Canvas Floater Frame is a frame that gives the canvas the illusion that it is 'floating' inside the frame. The sides of the canvas are separated by 3/8" from the inside of the frame. This 3/8" of space all the way around the canvas presents a unique appearance and makes the canvas appear to be floating inside the frame. 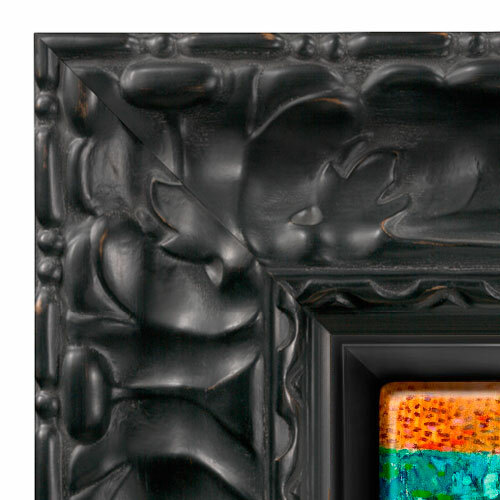 Canvas Floater Frames are very popular and somewhat new to the art world. Please see the link to the video below that will show you have to attach the canvas inside the frame. This will give a visual aspect of what I have explained. Happy Framing!